I originally thought my TMJD experience would make a good YouTube video instead of written blog post but I honestly just can’t with making and editing video content. 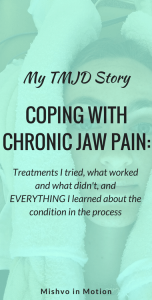 I thought I would write up the full story of my temporomandibular joint disorder (TMJD) aka chronic jaw pain for others who may be looking for information/treatment options. When I was in the thick of it all, I remember going online to look for other people’s stories, just to know I wasn’t alone in my pain. So first thing’s first friend: if you have chronic jaw pain that affects your everyday life, you are not alone. Here’s my story and everything I’ve learned from the professionals I’ve worked with as well as through digging into the academic literature about TMJD. Please note: I’m a patient, not a doctor. None of this is meant to be medical advice. If you have questions about your TMJ disorder or other health issues please talk to your doctor or dentist! This post may contain affiliate links which means I make a small commission if you buy something through the link. I only recommend products and services I use and LOVE and think you’ll love too. I was still wearing the retainer my orthodontist had made me years before when I got my braces off, so I incorporated the NTI by sleeping with just that and the top retainer. This setup relieved the pain so I stuck with it for three years. Then in 2017, I noticed the pain was getting worse, especially on my left side, and the night guard wasn’t really helping anymore. I struggled with the following symptoms. They waxed and waned: sometimes some were worse than others and some would be relieved and so on. I went to another dentist – the one my parents see – and he tried conservative treatment with me: massage, heat, NSAIDs, and a taking a muscle relaxer before bed. I think the massage actually made things worse and the muscle relaxer made me nauseous. My pain suddenly became way worse and I panicked. I went to the orthodontist for a consultation because I couldn’t imagine this problem was unrelated to the way my teeth fit together when I bite down. The orthodontist more or less said there’s nothing we can do here, you need to see an oral surgeon. They said this problem would not be fixed by moving my teeth around. So I went to an oral surgeon. He said he couldn’t diagnose me without an MRI, so I got an MRI on the joint. The process with the oral surgeon took MONTHS and during this time I was in pretty intense distress, both physically and emotionally. I have mild degenerative changes in the left mandibular condyle with anterior disc dislocation without reduction on the open mouth views. There is limited mouth opening. Also borderline partial anterior disc displacement on the right with reduction in the open mouth views. The oral surgeon recommended surgery – an arthroscopy – after seeing the results of the MRI. Then I was like wait wait wait wait. There has to be another option. If you’ve done any searching at all, you’ve probably come across dentists in your area offering exclusively TMJD treatment. You know the ones. You see ads for them in local papers, online… I didn’t super duper trust them but was curious to see what they offered and if it could help me. 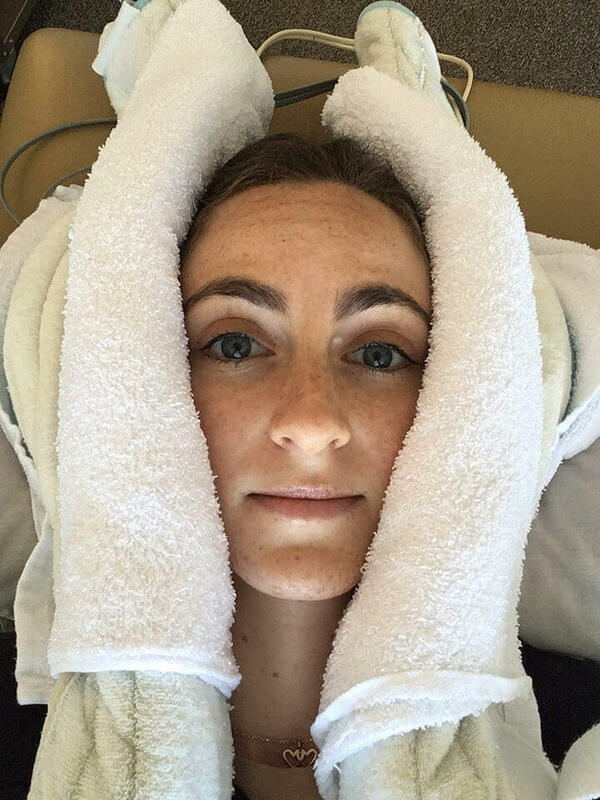 From what I can recall, the plan they presented at the consultation was to relax my muscles into their natural position using the TENS machine then create a splint that I would wear 24/7 for a while to realign my jaw into the position it wants to be in regardless of how my teeth actually fit together. Then after many months of this, once we know exactly where my teeth should be, I would get braces to move my teeth into the correct position according to where my jaw wants to be. And I would have to have the braces for 2-3 years they said. Without the orthodontic component, the treatment would have cost over $6,000 (!!). I kept exploring other options. I had experience going to physical therapy before for a tailbone problem (coccydynia, which apparently often co-presents with TMJD by the way), so I thought maybe I could try that for my jaw. 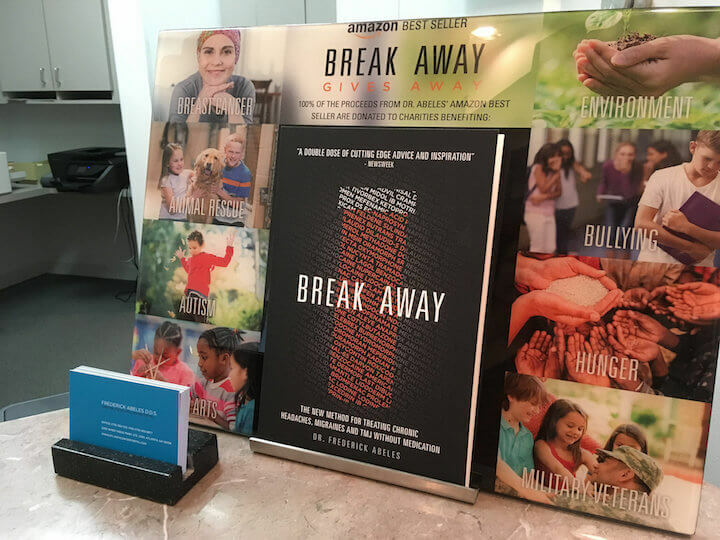 I Google searched and found a physical therapist in Atlanta who specialized in this – Steve Kraus – and set up an appointment. This was when things started looking up. The physical therapist said we should schedule 4-5 appointments and by then he would be able to tell if he can really help me or not (by whether I progressed or not with therapy). 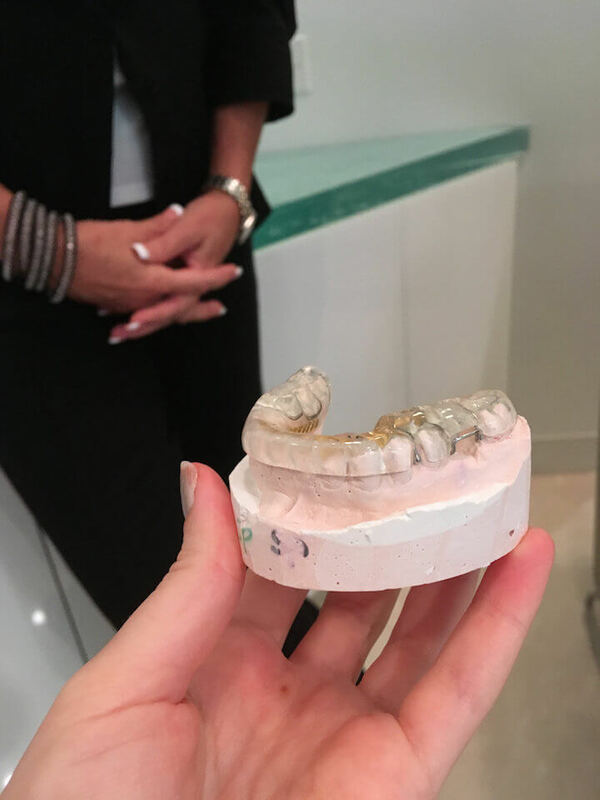 He also recommended I go back to the dentist who had done the conservative treatment to get a proper full-mouth night guard to replace the NTI in the meantime. Just a day at the physical therapist’s. Wrapped in heating pads. I started physical therapy and found it helped take the edge off my symptoms. I also learned SO much by talking with Steve. Therapy basically consisted of Steve teaching me lifestyle changes and stretches to do at home; stretching my neck; hooking me up to a TENS-like machine (I forgot what it’s called) and wrapping my jaw with moist heat while doing jaw stretches; and delivering an electrically-powered local NSAID to the left side of my jaw. 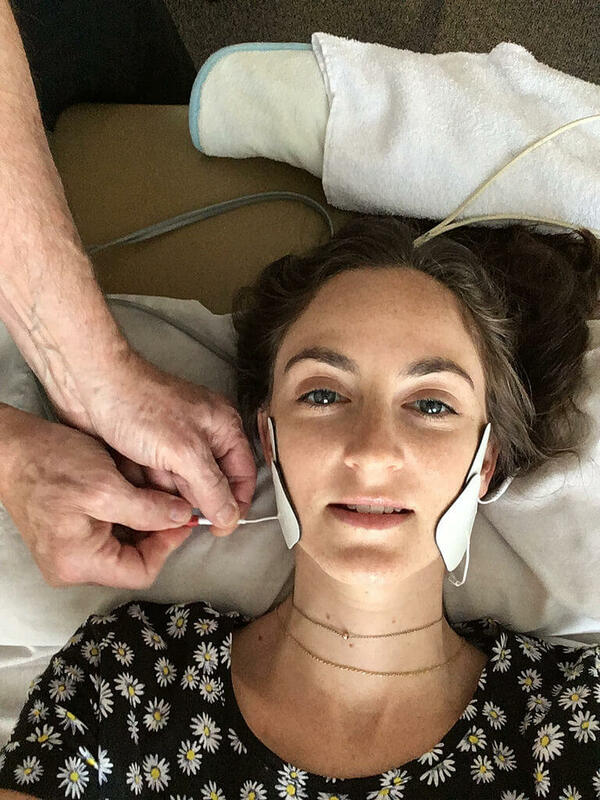 Getting hooked up to the machine that delivers pulses of low-grade electric current while I stretch the muscles of the jaw. Also some spooky lighting from below and me looking really relaxed, probably from the neck stretching. Then I went and got fitted for the new night guard which would cover all of my top teeth and basically ‘fill in the gaps’ of my very open bite along the sides. The night guard was a game changer. In retrospect, I should have just gotten it after the conservative treatment didn’t work instead of panicking and going to the oral surgeon. However, it is nice to have some sort of diagnosis (from the MRI scan) to understand why oh why I’m in so much pain all the time. I sleep with the night guard every night now. It has taken my pain waaaay down to a manageable, livable level. I still get achy after chewing foods that are tough or crunchy or if I’m really stressed out or tired (I think the tired happens because my body becomes generally inflamed). But I can finally live my life without thinking about my jaw pain every second of every day. 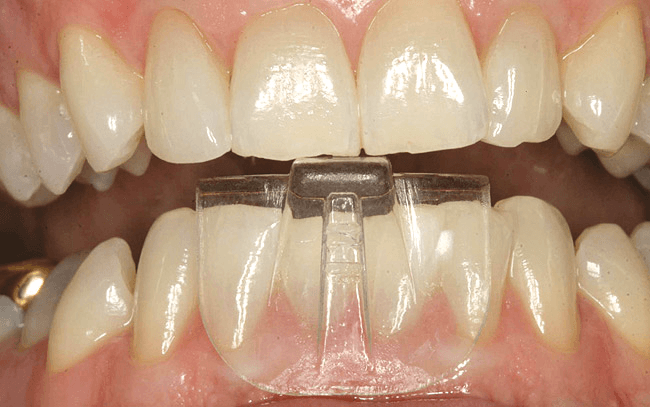 Malocclusion – this is the fancy term for misalignment of the teeth when you close your jaw. Types of malocclusion include an overbite, open bite, and underbite. Don’t be misled – orthodontic therapy/braces have not been shown to have a preventive or curative effect on TMD (Michelotti & Iodice, 2010). Instead, problems with your bite might be a cofactor in the web of complex causes of your jaw pain. There are two main types of pain you may experience: muscle (myogenous) pain and joint (arthrogenous) pain. Myogenous pain may be more decentralized in the jaw, neck, and head region. It may cause stiffness and limit the opening of your jaw or cause headaches. Arthrogenous pain is more localized in the jaw joint. It’s sharper and you’ll feel it mostly when you use your jaw. If you have this type of pain, it’s likely related to disc displacement or arthritis of the joint, or both. This article does a good job of explaining the different types of chronic jaw pain and their risk factors. Note that you can have both myogenous and arthrogenous pain at the same time. I do. The evidence says disc displacement – whether it’s with or without reduction – is not the cause of TMJD. Many people have disc displacement with or without reduction and don’t experience pain at all (Stegenga, 2000). That said, it is definitely involved in the equation somehow. But understand that putting the disc back into place is not going to fix your problem. They used to do open jaw surgery to put the discs back into place and they would slip right out of place again. Or they would put them back into place and the patient would still experience pain. So I recommend not worrying too much about the position of the disc. With this condition, it makes more sense to focus on symptom reduction. There are many options for treatment of TMJ Disorder, from conservative options to more permanent and serious changes like surgery. The first thing you should do is try conservative treatment. Your regular dentist should be able to guide you through this and prescribe you muscles relaxers and possibly prescription-strength non-steroidal anti-inflammatories (NSAIDs). I feel lucky in that taking two ibuprofen (aka Advil) or naproxen sodium (aka Aleve) tablets really helps my headaches and jaw pain, but some people need something stronger. This is the $6,000 treatment option from the Atlanta Center for TMJ (price not including the orthodontia part). No matter where you live, there are probably similar dentists who specialize in TMJ and offer similar treatment systems. I don’t recommend going this route because you want to avoid making permanent changes to your jaw/teeth as much as you can (see below). Also because it’s WAY too expensive and I’m dubious of any dentist who’s marketing reminds me more of a car dealership than a medical facility (even if it’s for-profit). There are different types of nightguards: the cheapest option will be the NTI but this should NOT be worn longterm because it can affect your bite. There are nightguards with a smooth exterior that allow your teeth to glide, and nightguards with a fitted exterior that force your teeth into a certain position. I have the former, allowing my teeth to glide and again avoiding making any permanent changes to anything in my mouth or jaw. I don’t know much about these options. Your physical therapist may offer some of these types of treatments and can best explain how they work and if they think they will be able to help you. Like I said, I pursued physical therapy to help treat my condition. Physical therapy is an especially good option if increasing your maximal mouth opening is one of your goals. It’s also something you’ll probably be prescribed to help with healing if you end up getting surgery. I don’t know much about this option either just because I’ve heard so much pseudo-sciencey stuff about chiropractors. I’ve heard anecdotal tales of people who swear by chiropractic work to help their jaw pain though. Arthrocentesis – this is a flushing of the joint with a saline solution without using any visual. It’s the least invasive surgery option and leaves the smallest scar. Arthroscopy – this is also a flushing of the joint with a saline solution but the surgeon uses a scope to see the joint while they flush. It leaves a small scar near the ear. Open joint surgery – this is the most serious and risky option. The surgeon will open up the whole area around the joint to operate. Based on what I’ve read, I don’t recommend this type of surgery unless absolutely necessary i.e. you have tumors or your joint is completely locked or something. Surgery should not be taken lightly and should be a last resort. One major part of any chronic pain condition is the emotional distress and anxiety it causes. 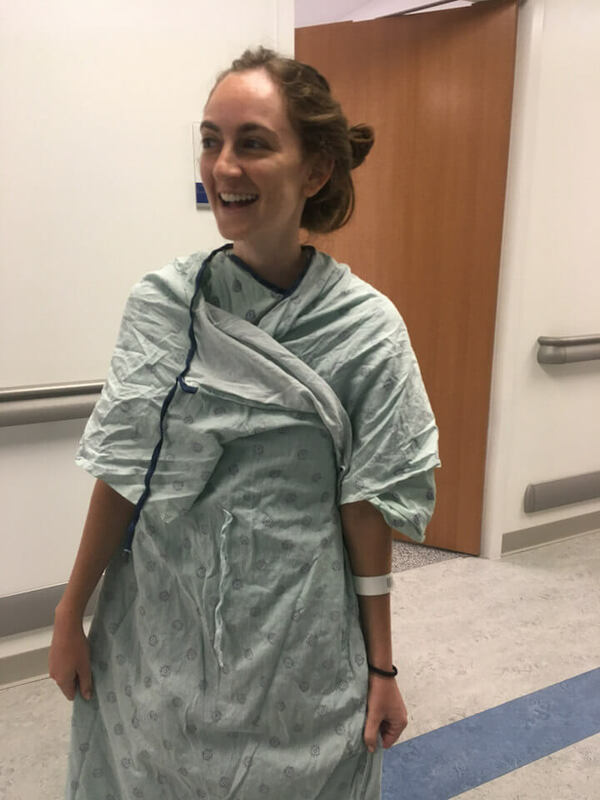 The worst part of this whole saga for me was overcoming the negative thoughts I had playing on loop in my head: I feared I would be in pain literally forever. I was heartbroken to think I would never be able to bite into an apple again or munch on a handful of nuts. The thing that made me the most upset was thinking I would never be able to make out again. Making out – not like kissing like a peck but properly tongue kissing – was so painful for me and it completely ruined the experience of it. I felt trapped in my body like I had no control, and the worst part was I felt like it would never end. 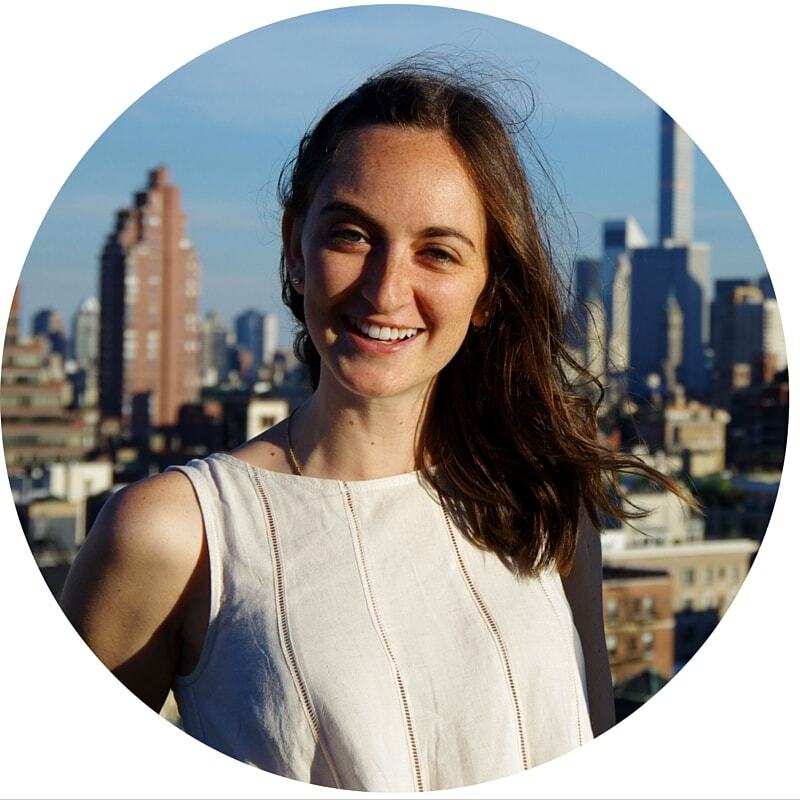 I was working with a therapist through Talkspace, an online therapy platform, at the time and she and I started a CBT regime. I tracked my pain levels and symptoms along with my mood while introducing exercise, meditation, and pleasurable activities and tracking those as well. I recommend working with a professional to track and change any patterns of thoughts, emotions, or behaviors around your TMJD using CBT. Talkspace is a great alternative if you’re looking for something a bit lower cost and convenient compared to traditional talk therapy options (my full Talkspace review here). One major thing I picked up from my reading and researching was that if you can, avoid making any permanent changes to your jaw or teeth while trying to treat your disorder. Most TMJD cases resolve on their own or with conservative treatment (Kurita et. al, 1998). For the others, studies are inconclusive as to which treatment option is more effective than any other. Each person’s anatomy and behavior/lifestyle is unique to them, and as I’ve said, the condition is multifactorial so there’s no one answer for every person. However, we do know that surgery isn’t any more efficacious in treating TMJD than a removable splint worn at night. 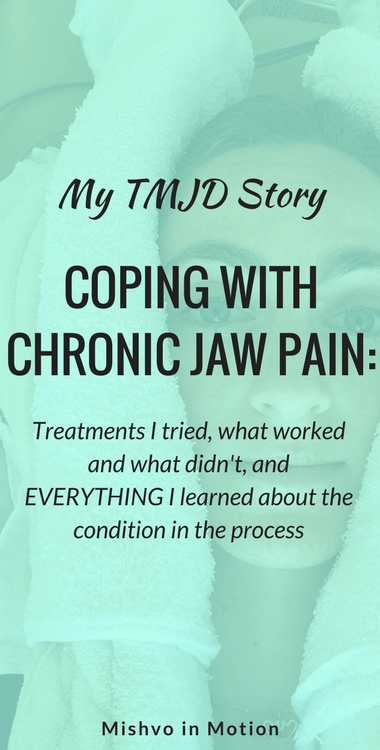 In the case of the $6,000 treatment from the specialized TMJ dentist, I was looking at a long road of treatment, including years with braces. 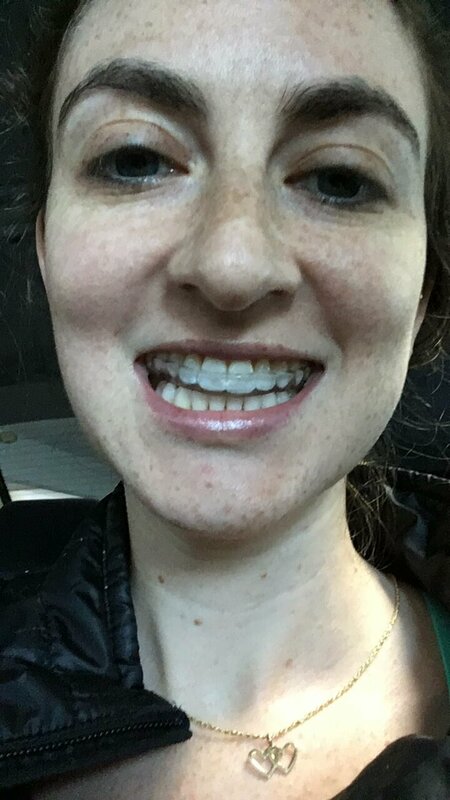 I reasoned that having braces for years at a time when I’m 30 years old, single, and already look 10 years younger than I actually am would make me pretty miserable. And on top of that, braces would ALSO be painful. So I would be trading one pain for another. When you think about treatment options, you have to consider that you are trading the pain and symptoms for something else. If that something else is also going to cause distress in some way, it’s a matter of deciding if the tradeoff is worth it to you. I think the best thing to do if you’re suffering from chronic jaw pain is to find an experienced general dentist you can trust. They should start you on conservative treatment, then try a nightguard if that doesn’t help, then move forward with any referrals to other specialists from there. Don’t give up seeking treatment if the symptoms are affecting your everyday life. You’ll have moments of hopelessness so I recommend connecting with others who deal with chronic pain or conditions to talk to. I’ve found they are truly the only ones who really understand. I’m really glad I didn’t get surgery and that I pursued physical therapy and the full-mouth custom nightguard instead. I’m also glad I did a lot of my own research. It’s hard to find medical professionals you can trust and it’s always best to be your own advocate if you have the resources to educate yourself. Feel free to reach out with any thoughts/feelings or share your story as well. I’d love to hear from you. Hi, I found your post on Reddit. Like you, I’m a professional writer and our symptoms appear to be very similar. I lived with bruxism and chronic pain for 20 years. Up until a few months ago that is. My migraines are now gone. I tried pretty much everything short of surgery and only one thing partially worked: antihistamines. The more antihistamines I took, the greater the reduction in bruxism and headaches. But that’s not a sustainable treatment because of the dangers of long term use. I mentioned this to my doctor and he had me take two allergy tests, one for inhaled allergens and one for food allergens. As it turns out, I’m allergic to all plants. Literally. Cutting those foods out of my diet (and using an air filter) has seemingly cured my condition. I suspect that allergies (everyone might have different responses) are a cause of bruxism and migraines for some people — perhaps most people. The elimination diet may be useful to people who suffer from chronic migraines/bruxism. If it’s allergies, an allergy test for inhaled and ingested allergens might tease out the cause. Trying a large dose of antihistamines could help too, but I wouldn’t recommend that for long term use — they block histamine production, which is known to cause a lot of problems. As a first step, though, please try an antihistamine. It may help. If it does, it might be allergies. I’ll definitely try the antihistamine thing and see what happens. Thanks for sharing this!! I was using Doxylamine Succinate (which is an active ingredient in some sleep aids but it’s not used in antihistamines, despite it being an antihistamine). But I’ve also used the non-drowsy allergy pills like Zyrtec, Allegra, and Claratin — they all work, just with differing degrees of efficacy. I suspect that relaxation and sleep hygiene methods might help some people because these techniques are known to positively impact how your body responds to allergens. Specifically, stress and lack of sleep are known to cause endogenous histamine production without exposure to allergens. Basically, you can have a low-grade allergic response to stress/lack of sleep. An allergic response can cause the narrowing of breathing passageways. And that alone can trigger bruxism. In short, once someone’s breathing passageway narrows, the body tries to clear the obstruction through clenching or grinding. Okay interesting. I’m really curious about this. I’m in Thailand so not sure which type of antihistamine they’ll have in the pharmacy but will go this weekend and pick something up to try. I’ll keep you posted. There are a lot of others out there, too. Most OTC sleep aids are also powerful antihistamines. Just a note: avoid any antihistamine with pseudophedrine in it (which is a stimulant). It will give you horrible insomnia and make bruxism much worse. Hello!I’m in a very similar situation. I’m 29 and for the last 1,5 years I’ve cleched the life out of my jaw muscles because of chronic pain and muscle tension. Now the results from the MRI are devastating:both discs have anterior dislocation and they are degenerated so badly that they are hardly visible. Most of the symptoms are on the right side where there is a clicking sound with every move. I have had a night guard for over a year but it doesnt stop me from clenching. The muscles are a bit more relaxed now because i finally started this special physical therapy to help loosen my whole body,deal with the pain and teach me to breath again. But at the moment I can’t eat. I use the blender to get something down. Today I got my first injections of botulin toxine to the masseter and temporalis muscles. This is the basic tmj treatment in Finland and possibly arthosentesis after this one. I am not sure if the pain is from the muscles or from the joint area at this point but eating is painful and causes muscles to spasm and contract. I’m scared that with every opening of my mouth I’m destroying the leftover discs even more. The dentists and surgeons I’ve seen are highly qualified but I still have trouble finding some answers. I feel like I can’t trust them because I have suffered so much and it took too long to get send to these special doctors at the university hospital. Would it be possible that you could write back to me and we could exchange our knowledge and experience? I put my email here, i hope it shows to you. I’m sorry to hear how much pain you are in. Unfortunately, your email did not display. Can you try fully spelling it out? For example, use “at” instead of the @ symbol. I’ll write you. MIshvo hasn’t yet responded to my post, but if they are still reading, have you tried the elimination diet? Hey Ky, I can see the email address from my end! I’m not sure if your question about diet is for me or not but no I haven’t…My pain was reduced to a manageable level through physical therapy, getting a new and better nightguard, and continuing to avoid tough-to-chew foods like apples. I have gone through periods of my life where I’ve eliminated dairy, meat, and high glycemic index foods (not all at the same time). None of that affected my pain however the low glycemic index diet did help my skin some (I struggle with cystic acne) — but in the end, cutting out refined sugar sucked from an enjoying-my-life perspective so it wasn’t sustainable for me. I’m currently based in Thailand and it’s sooooo hard to control what ingredients go into your food but what else would you try cutting out to test for allergies? Gluten? Hey, yes I can see your email! I’m sorry you’re in so much pain – it sounds awful. Has the botox helped at all? The one promising thing I can share is that your body is very adaptive and will do all it can to survive. So with the discs, even with them out of place, the part that is in between your joint will lose feeling and harden into a ‘pseudo disc’ (best explained in the youtube video linked in the main text above). I totally know what you mean about trying to find specialists who know everything there is to know about TMJD and who you can trust. Don’t give up though. Seriously, don’t give up looking for treatment options and doctors. I’d be happy to chat by email but everything I know about TMJD is basically in this blog post! My email is michelle@mishvoinmotion.com. Thank you so much for posting this! It gives me so much hope for conservative treatment. I am 30 years old, and just had my right TMJ disc displace anteriorly and medially on January 1st. It’s been a crazy two months going from specialist to specialist to figure out how to “recapture” the disc. EVERYONE has a different opinion. One says you can recapture with pivot splint, the next says that will never work, and you need an anterior repositioning splint, the next tells me, no it’s uncapturable and will lead to Parkinsons later in life, and another told me that it won’t recapture and that I will need surgery to prevent bone loss. After being injected and trying to get the joint reduced three times, I am now in an anterior repositioning splint which has made more problems than solutions. I was told it would help improve my chances of recapture if I wear it for 6 months up to a year and that “once a man sneezed and his disc went back in.” Prior to this device, all I experienced was decreased range of motion (no pain, no spasms, no anything). Now, I have muscle spasms, neck pain, atrophy of my temporalis, and some tinnitus. I am about ready to do what you did and try to just manage symptoms. Can I ask how long you have had this locked jaw? I am trying to find someone with long-term outcomes who can attest to a good prognosis with conservative management. Thank you so much! Agh I’m sorry to hear of this, I know how effing stressful it is trying to find a good doctor. And yeah it feels like everyone has different advice which is really frustrating. It’s really weird that someone said any of this was related to Parkinson’s?? I would love to hear the reasoning behind that. I’m also curious about the evidence behind the bone loss statement. It’s something I’m concerned about but also have no idea how to prevent it (surgery is definitely NOT the answer according to the literature I’ve read). I would lose the splint if it’s causing more pain/problems and not helping. If your only issue was range of motion before adding in the splint, I woud maybe look into physical therapy. Try to find a physical therapist in your city who specializes in the TMJ. They are very practical in terms of treatment and can help a lot with range of motion specifically – withOUT trying to recapture the disc. I wouldn’t worry about recapturing it, especially if you have no pain. To answer your question, I never had a closed locked jaw, just reduced range of motion. I believe my worst symptoms lasted a good 6 months. My maximal mouth opening started improving immediately with physical therapy (which was mainly stretching and exercises). These days I still get ‘flare ups’ and I’m not sure I can open my mouth as wide as before all this happened but overall the symptoms are manageable. Hey, I’m wondering what your experience was like with the ringing in your ears. I’ve had TMJ problems for 20 years, and the ringing only started about 2 months ago. It is by far the worse symptom I’ve had. It has taken the biggest toll on my emotional health. It’s giving me severe anxiety and I’d do anything to help quiet it. What was yours like? Was there anything you did to help reduce the ringing? Hey Paul! For the tinnitus, it seemed to ebb and flow alongside the other symptoms. Once I was able to reduce the jaw pain to manageable levels through using the new nightguard and going to physical therapy, I found the ringing in my ears also decreased. I wouldn’t say mine was as anxiety-inducing as yours — it would sort of get louder for a few seconds then die down throughout the day. What you’re describing does sound really awful 🙁 My dad has had some ringing in his ears lately and went to an audiologist. He is taking steroids right now to see if it helps. Hahaha totally! It’s probably no coincidence! I’m glad I found your blog post! I’m afraid I’m at the beginning of this journey. Growing up I was never able to chew gum for very long because my jaw would start hurting but it only started getting worse the last two months. Chewing food is a challenge and it comes and goes in weekly spurts. I don’t have the best insurance so I’m trying to find the best option to get relief. I want to start with a night guard for my upper teeth and see how that goes. Thanks for posting this! It’s nice to hear your experience with TMJD. Hi Danny, thanks for your comment. I completely understand the ups and downs of the pain. It’s the same for me as well, “flaring” with certain triggers. I definitely recommend trying the night guard – I had to pay for it out of pocket too but it was worth it. Turns our im clenching my jaw at night. I got a night guard from my dentist which actively prevents me from being in pain which is great! However I have developed a clicking jaw that I hear/feel every time I swallow or talk (its right in front of my ears). Did you experience this? Hi! I just came across your post and it’s truly giving me hope for my TMJ. I wanted to know how has your tinnitus been? Has it gotten better or gone away? Hi Taylor, It has gotten much better along with the other symptoms. If things flare up though, sometimes I’ll get ringing in my ears along with the jaw pain and stiffness.